When you think of an employee who is resistant to change, what comes to mind? First of all, just the way this is phrased makes it seems as if the individual has a personality disorder. I've seen plenty of what is called destructive resistance. 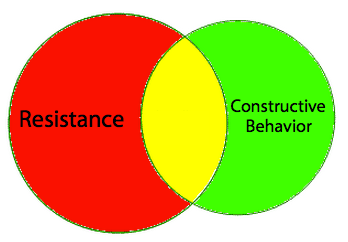 However, research on constructive resistance is on the rise. Positive deviance is the scholarly term for constructive resistance. The technical term is "constructive deviance," however deviance is so associated to criminal activity, I wish they had picked a different term (Warren, 2004). They mean deviation from the norm, but the way. Conflict is probably the easiest type of constructive resistance to tackle in this post. Groupthink theory (Janis, 1972) posits that a LACK of conflict is bad for a project's performance. Janis actually argues for the role of devil's advocate. He suggests that a leader assign someone to play that role. I don't know about you, the Janis solution hasn't exactly caught on. Instead, individuals are conditioned to say "yes" or pay the price of saying "wait a minute" or "no." TOO MUCH conflict is also bad for a project's performance. No citations needed for this idea as everyone reading this has experienced this problem all too much. If everyone resisted every change, organizations would go out of business very quickly. To re-cap, too little resistance (i.e. conflict) is problematic. As NASA or Enron is you don't believe this to be true. At the same time, too much resistance is problematic as well. We need the "just right" amount of resistance. Unfortunately, that is different for every organization, division, department, and work group. To put it in a percentage form would be purely speculative. And that is what blogging is all about! So, I'm going to say the right amount of resistance to change is about 5% "healthy" resistance. 5% "unhealthy" resistance can spread like a cancer and kill your project. Stay tuned for my next post to describe the differences between healthy & unhealthy resistance and how to spot both in your organization. Janis, I. L. (1972). Victims of groupthink. Boston, MA: Houghton Mifflin. Warren, D. E. (2004). Managing noncompliance in the workplace. In R. E. Kidwell & C. L. Martin (Eds. ), Managing organizational deviance (pp. 131–150). Thousand Oaks, CA: Sage.